Customer Organisation: Cockburn College of Arts, Leeds. Location: Cockburn College of Arts, Leeds. 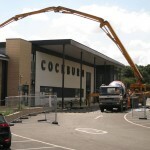 Stocksfield were principal contractor for the construction of a new large canopy structure over an existing courtyard at Cockburn College in Leeds. Internal lighting, vending and a food servery were integrated into the design. on technology to formulate CAD drawings to determine the exact internal dimensions of the courtyard. 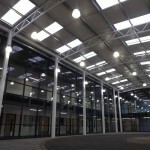 This information was utilised for the off-site steel work fabrication of the columns and roof sections to form the canopy structure. 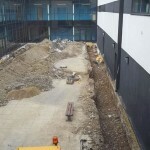 We carried out all associated groundworks, by stripping the existing area of block paving as required and carrying out excavation works around the perimeter of the building to form the base for the frameworks foundations. 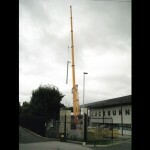 Concrete works were carried out from high level using remote control concrete boom pumps overhead. Bolt boxes for the steel frame bases were installed as the concrete was being poured and positioned by total station. 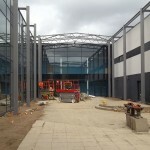 Steel work was then brought to site and craned over the existing building into position to form the canopy structure. 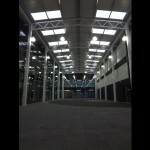 Internal lighting, block paving, drainage and decoration works were undertaken. The works were undertaken and completed within the school holidays, so that the students could return to the new facility after the break.